We have no bbq contests scheduled until February. We need to occupy our weekends with some food activity. 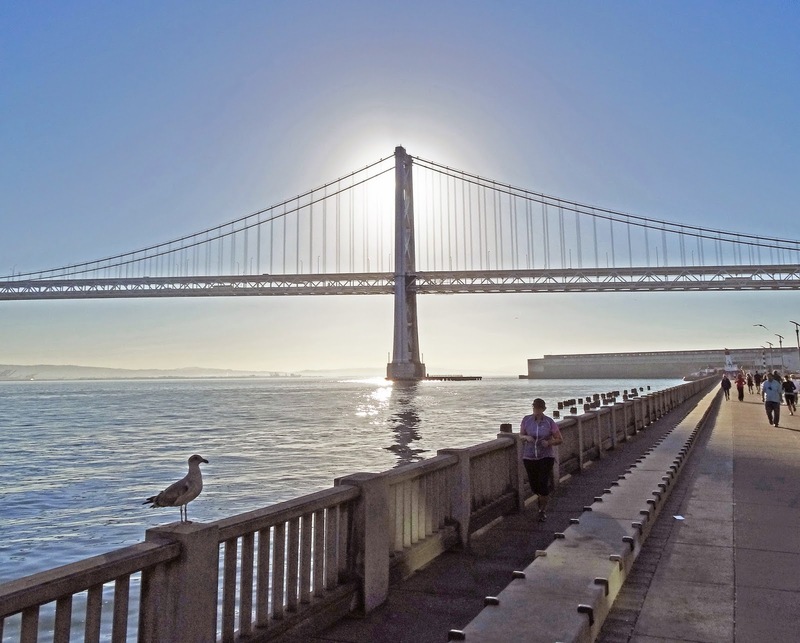 Let’s go to the Ferry Plaza Farmers Market in the ‘City’. We are no strangers to this grand gathering of farmers and food purveyors. It seems that every time we go to this market we discover some new and exciting food item. This trip was no different. We happened upon ‘Mexican Gherkins’. 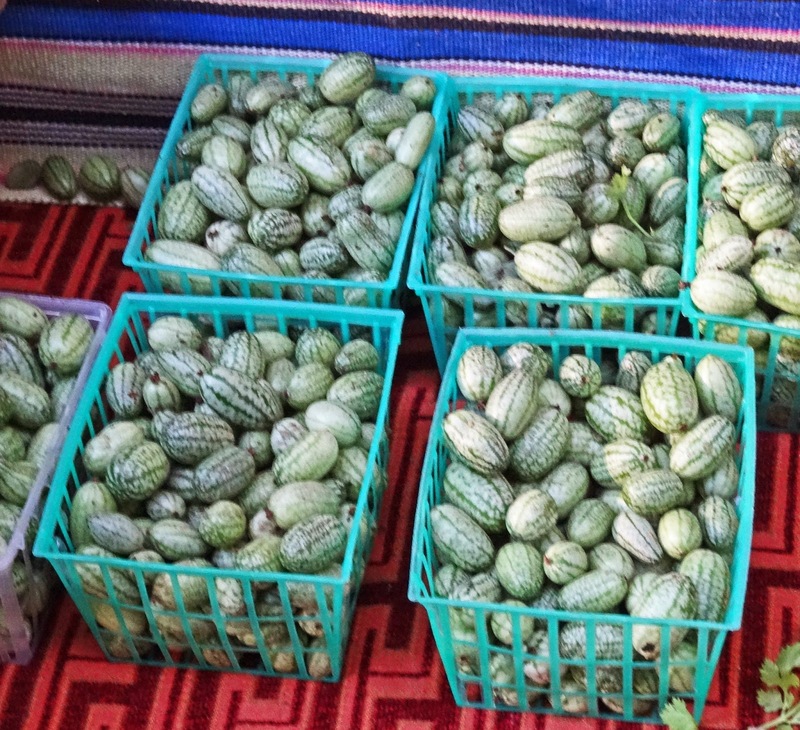 They are basically small cucumbers that look like tiny watermelons. The farmer happily offered us samples of the ‘Mexican Gherkins’. They were crisp, juicy and tasted like a cucumber with a slight bitter finish. These would be perfect to make into pickles. Of course these pickles would have a Chilebrown twist. This would be the addition of the deadly hot ‘Ghost’ pepper that I have growing in my yard. 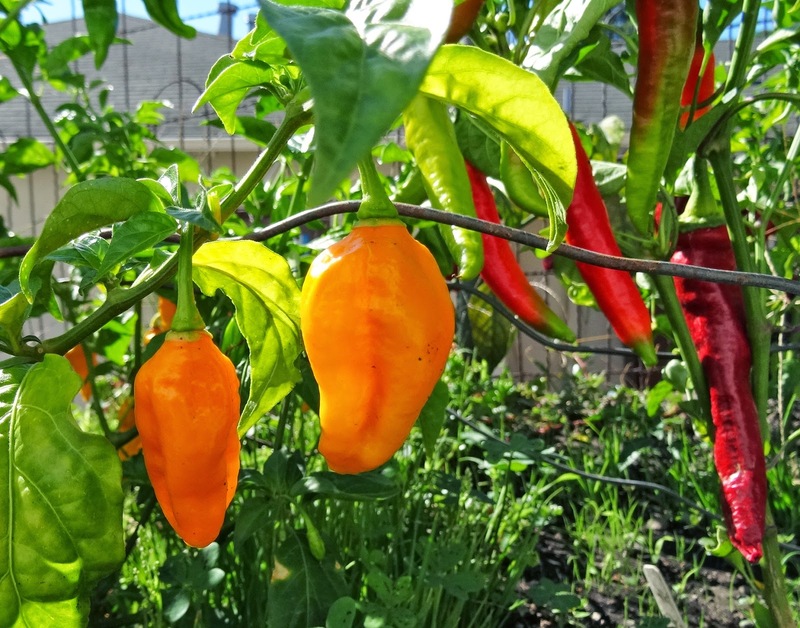 A Ghost pepper is one of the hottest exotic pepper in the world. I can personally attest to that. My Ghost pepper plant is in it second year of growing. The first year I nurtured it from a small seedling. It was protected during the winter from frost and the elements in a pot situated in a covered patio. This spring I took the deadly Ghost pepper and planted it in a warm sunny area. We were rewarded with a healthy nuclear bush bomb of peppers. I have eaten minuscule quantities of this pepper. It is a humbling and daunting experience. 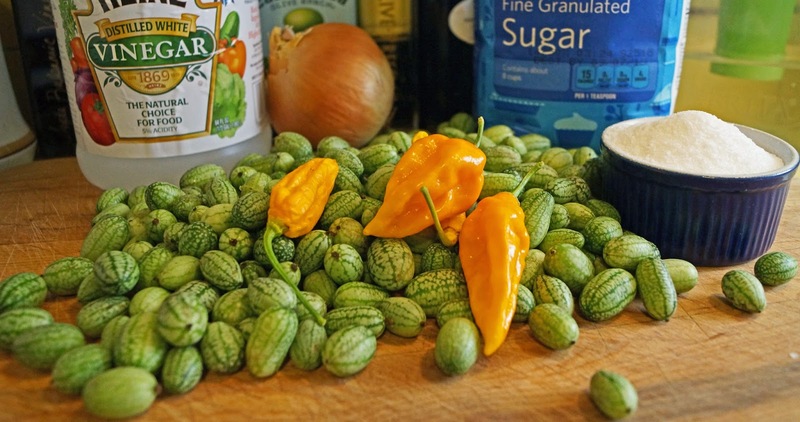 To use these in a pickle recipe will be interesting if not deadly hot. 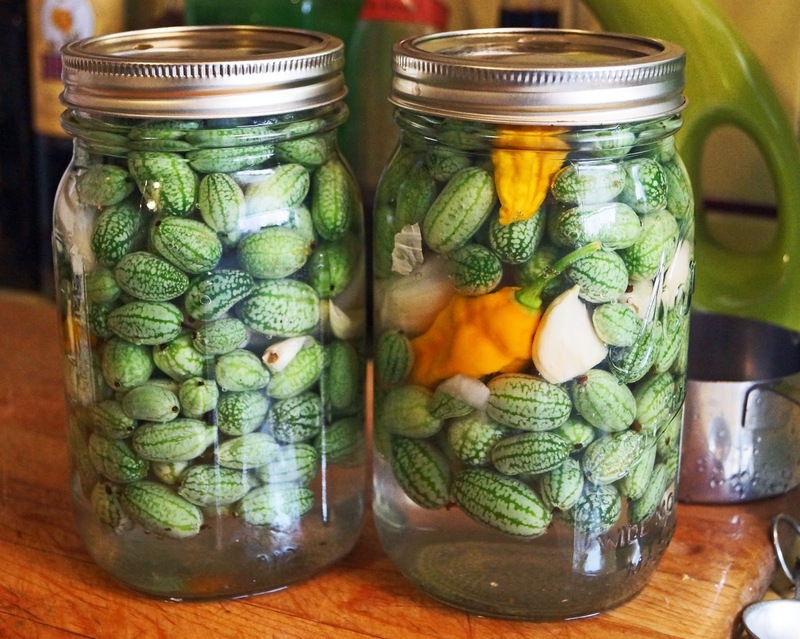 We brought our gherkins home and rinsed them in cool water to remove any surface dust or dirt. We are using a simple brine to create our pickles. You can find the complete recipe by clicking: this link here. We layered gherkins, onions, garlic and several whole ghost peppers in a clean mason jar. We poured hot brine over the mixture and screwed on the lid. It is now time to wait for the brine to do its magic. The do need to pickle for several days, so stay tuned. I am a little apprehensive to sample the finished product. Ghost peppers are no joke. I look forward to your report on the finished product. I grew some Caribbean Reds one year and found very little use for the loads of peppers I got. Big Dude, I am looking forward too if not a little scared. Caribbean Reds sound extra hot. There used to be a guy at work that made pickles with Habanero peppers. They were nice. These will eclipse those. I can't wait to see your review. May I suggest a homemade oreganata sauce with those ghost peppers? Three Dogs BBQ, I had to look up oreganta sauce. I found recipes for clam and one for pork chops. These peppers are so potent that a very small amount would have to be used. Maybe, but I doubt Ms. Goofy will approve. I added one to a large bowl of purchased salsa yesterday. It lit up the stoplights for sure. Zoomie, I have not tried them yet. I am a little scared. Greg, They caught our eye immediately. They are fun looking. greatwhite hunter, mere mortal indeed. Anytime, Anyplace we can do battle in the Ghost pepper eating arena. Bye, the bye, do you miss the Salt Mine?